We have detected your county as County!. If this is not your county, please use the state map below or the state links at the bottom of this page to find your location. There have been over 38883 New County Foreclosures in the past 90 Days! 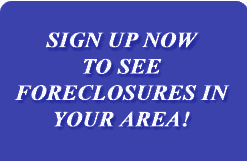 See some of the County foreclosures below! Get 3-5 free alerts weekly! Map not showing? Install Flash, or Use the state links below. A Foreclosure occurs when a borrower defaults on their agreement with their lienholder. The lender will then attempt to cover their losses by selling the property. Because of this, the lienholder is only allowed to sell the house to cover their losses and any legal costs. This allows investors to purchase properties below the actual value. Our foreclosure listings actually show a price history unlike other sites, so that you can tell how motivated the selling realtor is to "unload" the property. If the price is dropping rapidly, they are more likely to be motivated to sell. In addition to foreclosures, we provide the largest number of wholesale properties (properties for sale by discount home buyers), motivated seller leads (homes for sale by indivduals that have submitted our online for to sell fast), bankruptcy properties, and for sale by owners. There are 22711 Foreclosure Listings on sale for April! Plus, Motivated Sellers, Wholesale Properties, Bankrupcty Leads, and For Sale By Owners!